World of Warships is the next in the line from Wargaming, which also publishes World of Tanks and World of Warplanes. It is an MMO featuring strategic naval battles on a variety of ships. The highly anticipated World of Warships is the latest free, historical online combat game to be added to the Wargaming’s catalog. Command a massive naval fleet featuring history’s most iconic war vessels, level up important tech modules and prepare to dominate the oceans in World of Warships. ►The game gives players a fleet of ships to use in the open sea. Destroyers, battleships, heavy cruisers, and aircraft carriers all support one another with their varied abilities. Stats on the ship play a large role in how it will perform, and you must keep an eye on things such as firepower, speed, armor, and endurance. World of Warships features realistic, historical locations, and changing weather patterns to heighten the experience. ►With four classes of ships, myriad upgrades, and strategically designed environments the action never ends and every match is a unique experience. 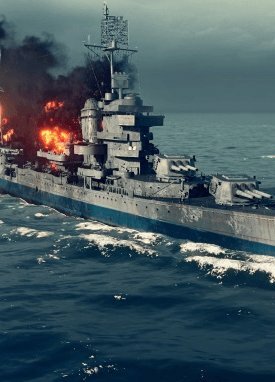 Every sea battle is a unique experience with a wide range of battle maps that deliver a myriad of strategic options and scenarios for high stakes PvP team. Endless hours of strategy, tactical gameplay and pulse pounding combat await all who take the helm in World of Warships! Aircraft carriers — A multi-role ship that brings a RTS-style gameplay to the fight. Loaded with four styles of aircraft (Dive Bombers, Torpedo Bombers, Scouts and Fighters) and the ability to command multiple squadrons, carriers can shape the fight from the skies. Cruisers — These versatile vessels are perfect for hunting other enemy cruisers, spotting them for teammates to target or blowing them out of the water personally. Additionally, the anti-aircraft guns that line their deck offer another line of defense against high flying threats. Destroyers — Lightly armored but swift, destroyers are the fastest, most maneuverable ship available. This class is a major threat on the open water, dealing damage with either massive cannons or deadly torpedoes. Battleships — These are the designated “heavy hitters” of World of Warships. Massive cannons, thick armor and rows of anti-aircraft artillery make them a deadly “triple threat” in any battle. There are a number of purchases available that help both in and out of the battlefield. World of Warships is pushing the limits of military arena gameplay in astounding ways each and every time I've visited. Wargaming announced that tomorrow, April 16th, 2019, World of Warships: Legends enters Early Access on console. World of Warships: Legends, the console iteration of the Wargaming seafaring title now has Founders Packs available. World of Warships: Legends is getting ready for a release on Playstation 4 and Xbox One, to bring the mighty battleships to console finally. +Variety of ships each supporting the others. +Intense action PvP with changing conditions. -May not appeal as much as tanks and warplanes. Description: World of Warships puts an armada in your hands! Utilize a variety of ships in your fleet, including aircraft carriers, battleships, heavy cruisers, and destroyers. Employ strategic combat skills to sink your opponents, or avoid their strikes against you.